IoT never really gained mainstream status. Most „smart“ products on the market are nothing more than ordinary products with a screen slapped on it. These products don’t bring true value, so as soon as the novelty factor wears off, consumers move on to try the next „smart“ thing. Innovation in IoT is driven not by the needs of the market, but by the need of product companies to create new products and turn a profit. To bring innovation to IoT, the products need to be repositioned to address real pain points in everyday life. Onion aims to do that with the Omega2 by making hardware development accessible so everyone can start solving problems in their lives with IoT technology. 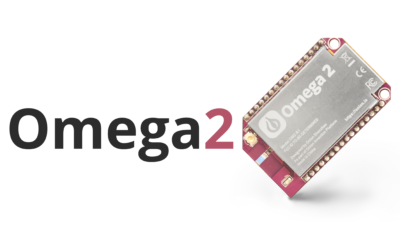 With a myriad of hardware development boards already on the market, the Omega2 is uniquely positioned as having the advantages of single-board computers such as the Raspberry Pi as well as microcontrollers such as the Arduino. It is much smaller than the Raspberry Pi (less than ¼ the size), and it is much more power-efficient, yet at the same time, it is much more powerful and robust than the Arduino, allowing it to be used in applications such as video/audio streaming, etc. Because the Omega2 runs Linux, and for inexperienced developers, developing on it will feel much like using a regular computer. An added advantage to supporting Linux is that the Omega2 supports many programming languages. This capability makes the Omega2 approachable for existing programmers who are new to hardware development, allowing them to build hardware projects with familiar languages and programming environments. Finally, for users with absolutely no experience in programming, the Omega2 integrates Node Red, a programming environment developed by IBM that allows users to program IoT devices by simply dragging and dropping block diagrams. Onion is a startup that aims to create “The Invention Platform for the Internet of Things”, a collection of hardware and software development tools that simplifies the process of creating and manufacturing connected products. The company is based in Boston, Massachusetts, with operations in Toronto, Canada, and Shenzhen, China. Onion completed a very successful Kickstarter campaign last year to launch the first generation Omega. Onion is backed by Techstars, and went through their 2014 Winter program in Boston. Dieser Eintrag wurde veröffentlicht in Crowdfunding, Development, English, General, Hardware und verschlagwortet mit Board, Kickstarter, Linux, Onion von Sebastian Trella. Permanenter Link zum Eintrag.